Somethings wrong with my Mac, what should I do? 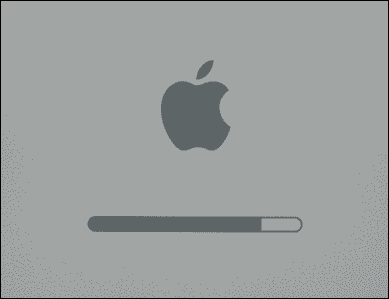 The first step to take when your Mac isn't working properly, is to determine if it's a software or a hardware problem. In the first case, there are a few bits and bytes (computerdata) messed up. This you can repair yourself. Software problems are not covered in the guarantee service. In the second case, there's something physically wrong with the machine. This is something for your dealer and an Apple Authorized Service Center. Relax: 99 out of a 100 times it's a software problem. Apple does make reliable machines. So don't think too soon that your Mac is broken. NOTE: sometimes the border between hard- and software troubles can be crossed. Bad RAM (random access memory) can be the cause. You'll soon find out about this soon after you gave your Mac some extra memory. It's important to let Software Update do it's job. I lost my login password! 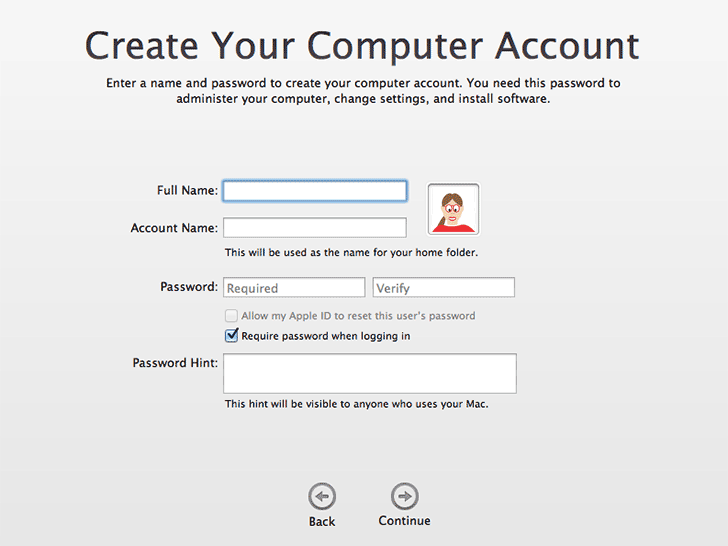 When you use a wrong password for three times in a row, Mac OS X will ask you for your Apple ID. With the help of your Apple ID you can change your account password. So it's wise to remember your Apple ID too!*. 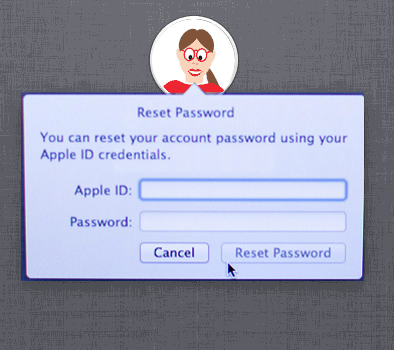 Make sure your Apple ID was connected to your Mac OS X account before (like explained in the User chapter). Otherwise it won't work! Did you forget it all? Well, then you have to visit an Apple Store with your original receipt / proof of purchase. Give them a call an ask if they are able to help you! *Write your passwords down somewhere safe! Most things will sound as Abracadabra to you, but Google is your friend! Help my Mac's in trouble! System crashes are quite rare in Mac OS X. What cán happen, is a program that doesn't react anymore. 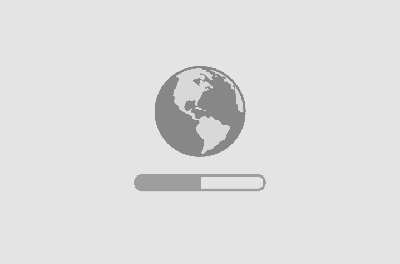 It's showing an eternally turning 'beach ball' or doesn't do anything at all. In a case like this, you can stop the program forcefully. This is called 'Force Quit'. Shortcut: Command+Option+Esc (yes that are three keys at once). Sometimes a program keeps working badly, even after a forced quit or restart. What you can do then is throw away the program's Preference file(s). 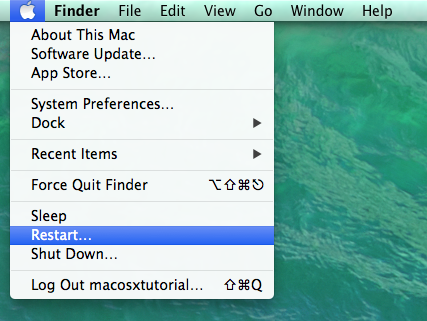 Restart your Mac afterwards. Why could this help? 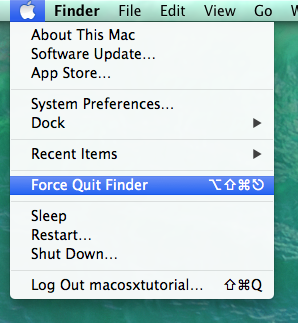 Every program saves Preferences at quitting and uses them again at starting up. Are there fault's in these prefs, then even after restarting the program, the same mistake will be made because the same preferences will be used. 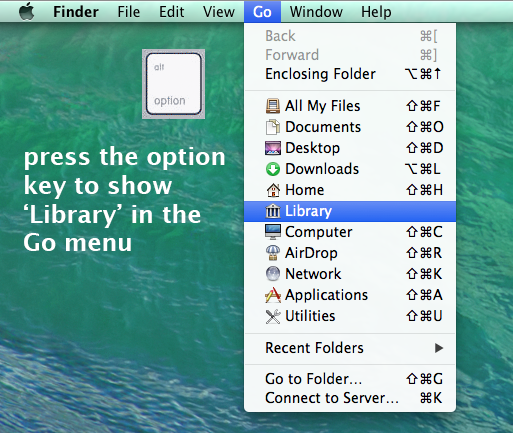 Keep the Option (Alt) key pressed and go to the Finder Menu 'Go' and then to 'Library'. 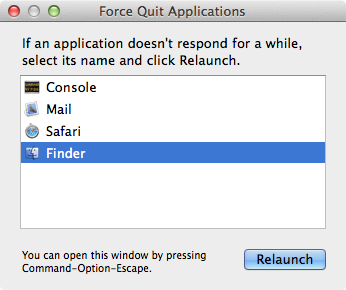 A new Finder window will open. It's the Library folder. Look for the 'Preferences' folder in it. This is the one you need. Preferences are decorated with the term .plist at the end of their name. Now you search for the correct one that gives you trouble. Drag and drop your 'programprefs.plist' to your Desktop. Don't throw it away yet, but first Restart your Mac and test the program. Troubles are over? Now you can throw the preference file from your Desktop to the Trash. The Finder and it's Dock also have their preferences. You can also throw them away. Don't forget to Restart! NOTE: When you throw away your Dock preferences, the Dock goes back into it's original state. You'll have to throw in your favorite programs again. Same with all programs, user specific settings will be restored to default! Did you throw away it's preferences, but the program still doesn't work properly? Then you can decide to re-install the program. If there's one, use the un-installer (neat developers do make un-installers for their work). 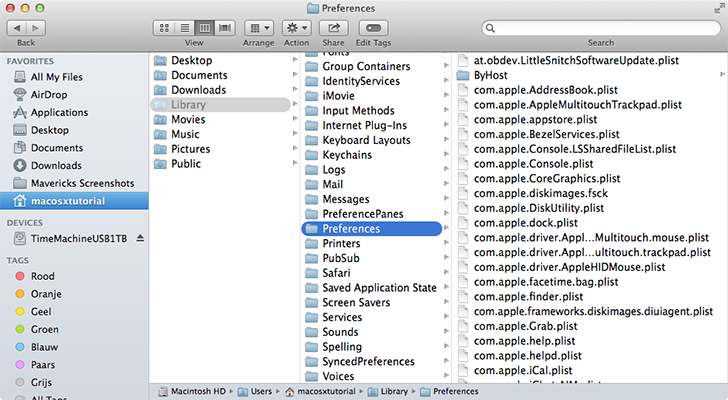 Otherwise, drag and drop the program in the Trash, together - and this is important - with it's Preferences! Use Spotlight to search for other program files if needed. Maybe you need an upgrade? Pay attention to the version of the program. Maybe an upgrade or update will help? Visit the website of the manufacturer to inform yourself of the system requirements, to see if your version can work together with your Mac OS X version. NOTE: there are programs that are very sensitive to Mac OS X system upgrades. An example of this is ProTools, a professional audio editing program. Better to keep an eye on the developer's website to keep yourself informed in case there's an update or upgrade. 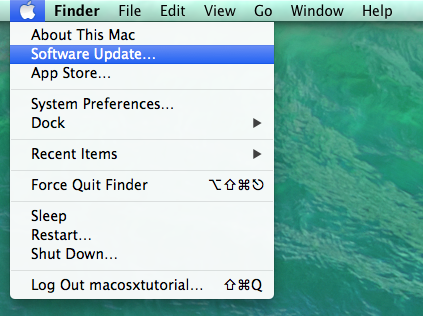 There's a simple test you can use to check if the problem is in your user section or in the general Mac OS X system. Just log in as another user. How to make a this user, go to the User chapter and then to => More Users. - To many apps open at once? - To many windows or tabs open in your browser? - Hundreds of loose files on your Desktop? - A slow (USB 1.0) external hard disk? This will slow down your Mac, specifically with the opening and saving of files. - Spotlight is making an index? This is temporary, Spotlight needs to index the contents of your Mac first, before it can find everything fast. - Slow start up can be caused by too many 'Open after Login' programs, or 'Open windows at login' checked on at shut down. - Is your software out of date, does it consume too much RAM? - External hard disk that can't handle 'Sleep' very well? - Network disk giving you trouble? - When did you Restart for the last time? A restart might do wonders. - How about your hard disk, is it quite full? This is a well known cause of slow Mac's. 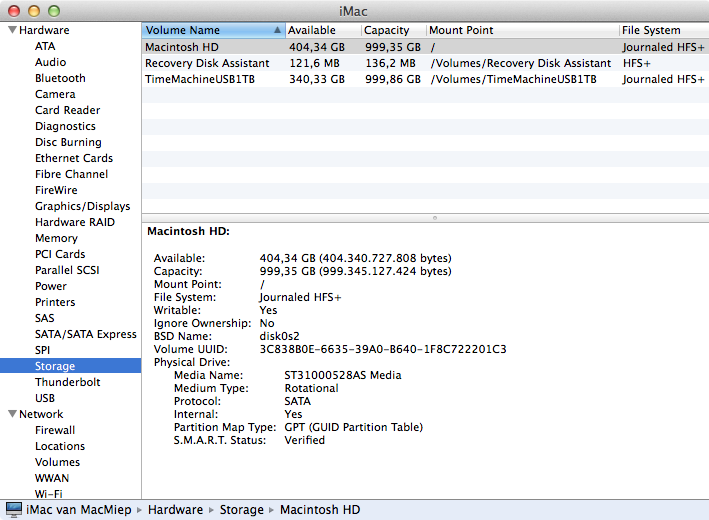 Mac OS X uses the hard drive as a backup for the RAM as 'virtual memory'. To little Random Acces Memory could also be the cause of a slow Mac, but this depends on how recent your Mac is and what you're doing with it. 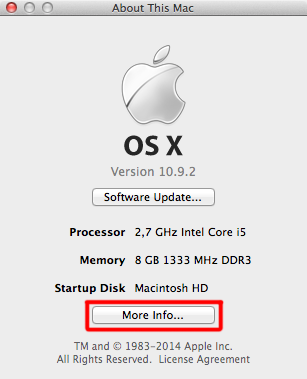 Mac OS 10.9 Mavericks uses RAM differently than older Mac OS X systems. It tries to use all RAM available, to make your Mac faster. How much memory (RAM, hard disk) does my Mac have? Use the Utility 'Activity Monitor' to get an insight in how your Mac's memory is being used. 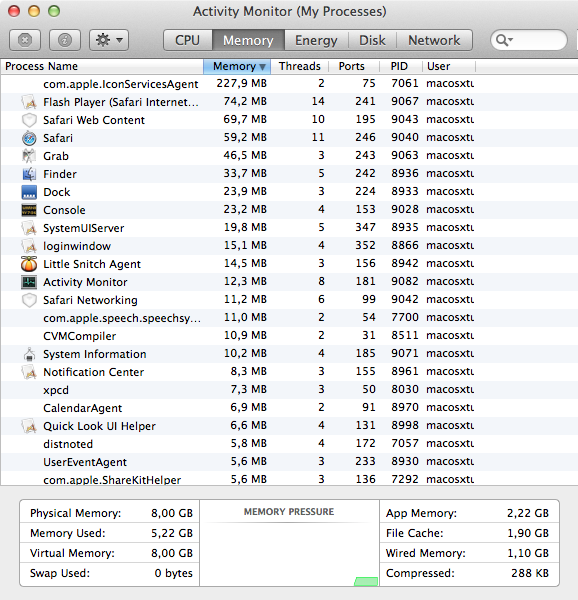 In case of a slow Mac, you should look for a program or process that uses too much RAM. Spotlight is your friend to find Activity Monitor fast. Memory: what program or process uses too much? Disk: what process uses your hard disk excessively? CPU: what program or process uses your Central Processing Unit excessively? Same for 'Energy' and 'Network'. Did you find the guilty one thanks to Activity Monitor, then throw away it's Preference file (as shown before in this chapter) or re-install or upgrade the program. In case it's not a program but a process that you can't upgrade or remove yourself, you might consider instalingl a fresh Mac OS X system with keeping your data. Later on this page you'll see how to do this. Re-installing the operating system, in other words re-installing Mac OS X, does wonders. Explanation in a moment. Be careful with using programs who pretend to 'clean' your Mac! They can give your more trouble than they can solve. Examples are CleanMyMac and MacKeeper. Why do you warn for these, MacMiep? With that, MacMiep has seen many forum topics about people with problems after using Mac cleaning programs. Waarom wordt soms het dan geadviseerd en krijg je zelfs korting? Er zijn websites die (tegen betaling?) het gebruik van deze software aanraden. Het zou je Mac sneller maken door caches en logbestanden te verwijderen. Ook zou veel harde schijfruimte worden bespaard door het verwijderen van overbodige talen. Tien tot 20 GB harde schijf winst wordt genoemd. More space on my hard drive thanks to such a program! Ten to twenty GigaBytes could make you happy in case of a MacBook with a small SSD hard drive. But most Macs have a hard drive with at least half a TerraByte on board. Then, 20GB is PEANUTS. Do you want to give the whole wellbeing of your Mac into the hands of a program for only 2% profit of hard disk space?!? Mac OS X is a UNIX systeem. All UNIX systems have a self-cleaning ability. This means cashes and logs are taken care of daily, weekly or monthly. How DO I clean my Mac? Use a soft cloth for the screen together with a special computer screen spray, and a vacuum cleaner for the keyboard. At the inside, a can of pressed air can blow away the dust, if needed. Don't use alcohol containing cleaner to clean your screen. 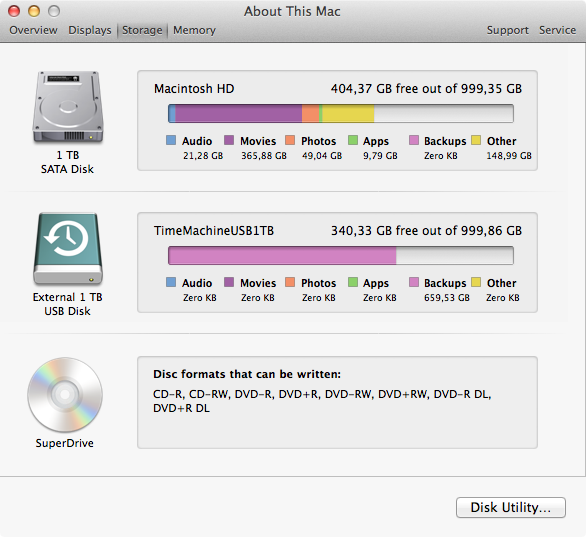 Defragmenting a hard drive isn't necessary on Mac OS X. There can be large discussions on Mac fora if it's wise or not. However, in case of using very big files (HD video for example) it could be useful in case your Mac starts getting a bit slow. Important: DO MAKE A BACKUP BEFORE YOU START DEFRAGMENTING (Time Machine). In case you loose power when the defrag program is running, your data could be damaged! 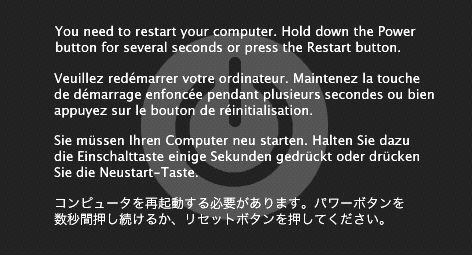 This is called a 'Kernel Panic' and there's nothing else to do but use the power button of your Mac to shut down. First check if the batteries of your mouse or keyboard are still working. After a hard shut down or in case of electric power down, it's wise to do a so-called 'Safe Boot'. Safe Boot: first choice at system-trouble. Boot the Mac with the Shift key pressed. Automatic Login will be shut down, so you'll need a password to log in. You'll see 'Safe Boot' in the screen. Safe Boot forces your Mac to check up on the hard drive's file system and some other stuff. So don't be alarmed if the booting process takes longer than normal. Restart your machine after booting in Safe Boot mode! This is because your Mac won't work like you're used to. Some processes are shut down at Safe Boot, for example Wi-fi. During the installation of Mac OS 10.9 Mavericks, a special partition has been created on your hard drive. This partition is hidden, so normally you'll never see it. On this partition, there's an installer of Mavericks and some Utilities programs. This installer uses the internet to download system data from the App Store, in case you need to re-install Mac OS X.
Apple has made a little program to make an USB recovery stick for free. Use a stick of minimally 1 Gigabyte for this. 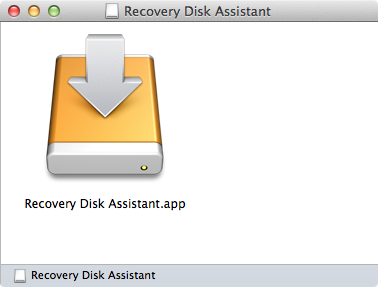 The program's name is OS X Recovery Disk Assistant and can be downloadedd at http://www.apple.com/osx/recovery/. 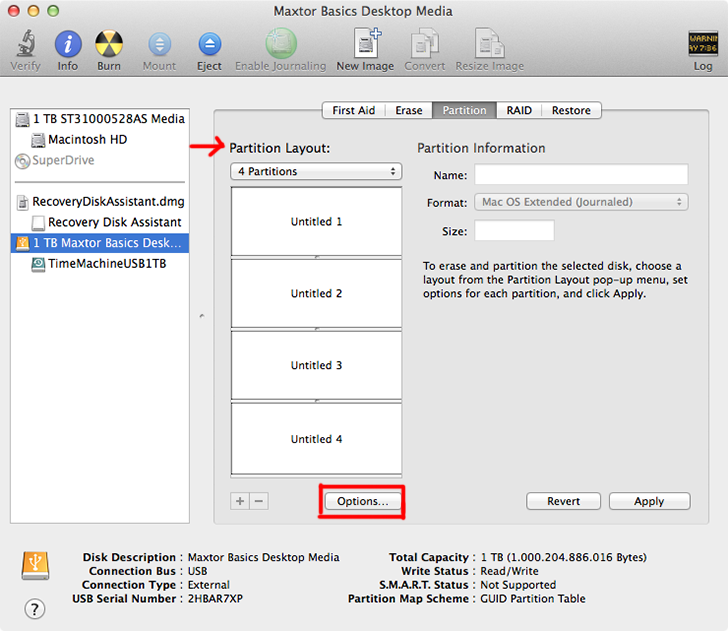 How to make a Mountain Lion Recovery Disk Assistant? NOTE: this program is obviously suited for Lion, Mountain Lion en Mavericks! You'll need an administrator password to do this! Be careful using older system disks! Mac OS 10.7 Lion and higher don't use system disks (cd's or dvd's you used to get with your new Mac). Never use these old disks to recover or repair a newer OS X system! 2. Boot the Mac with the Option-key. 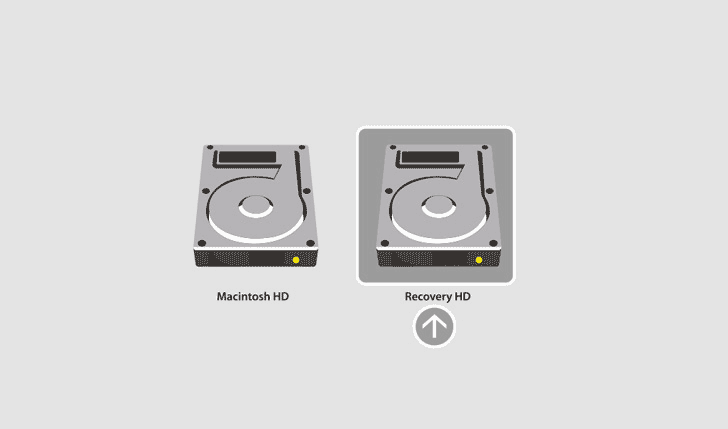 Now choose the Recovery partition (or USB recovery stick). - Restore from Time Machine-backup. SeeTime Machine about how to make one. 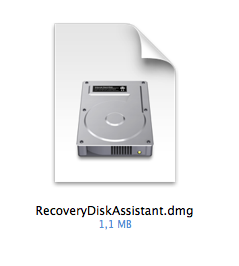 Boot from Recovery and go to Disk Utility. 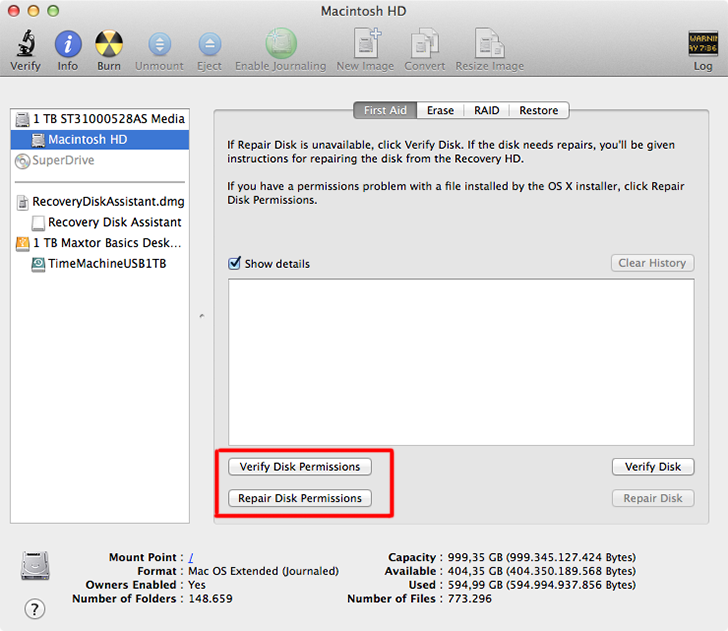 Click Verify Disk Permissions and, if there are faults found, on Repair Disk Permissions. This might be a solution to some problems. But where not there yet. Let's now check our hard drive. *Self-Monitoring Analysis and Reporting Technology. Many hard drives have a chip on board that self monitors the disk. This chip can be read with Disk Utility, but an alternative program who gives you much more information is Smart Utility. You can see the SMART status at the bottom of the Disk Uitity window. Does it read Checked, then there's no problem. BACKUP IMMEDIATELY AND REPLACE THE DISK! NOTE: not all external hard disks have a SMART function on board. 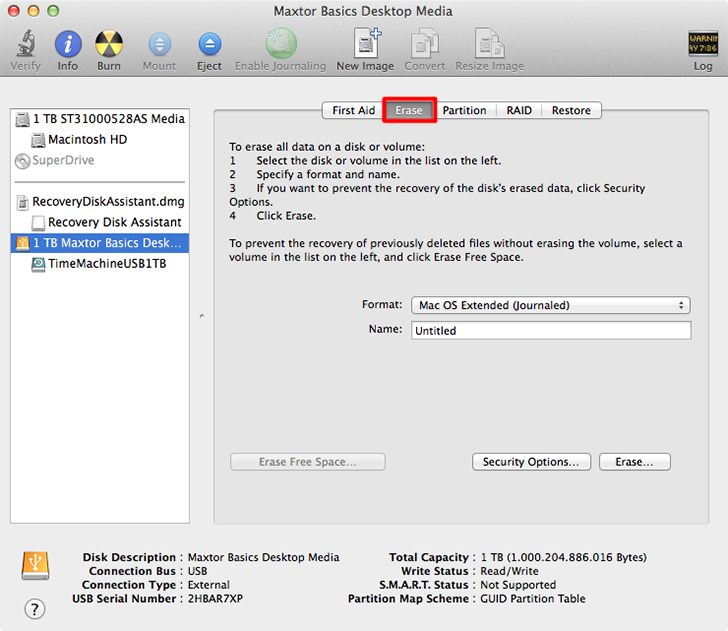 How to test your Mac's hard disk. Boot from Recovery (preferable a USB stick) by using Command-R or Option-key at startup. Choose ‘Disk Utility’. Select the proper disk and choose at the First Aid tab op Verify Disk and after that - if needed - Repair Disk. NOTE: Disk Utility won't change anything with your hard drive during testing. It won't change any bits or bytes unless you choose 'Repair'. 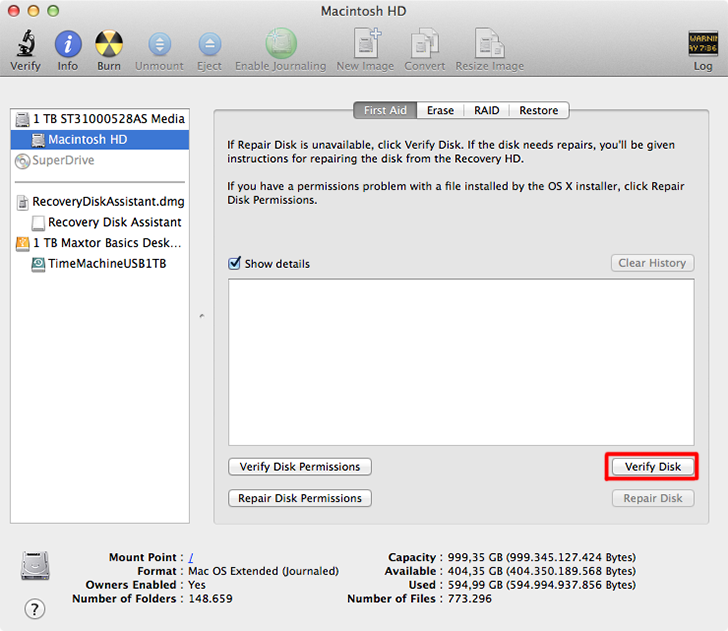 In case Disk Utility can't repair your hard drive, you have a real problem. Hopefully you have a backup of your data! 1. try to repair the disk with other software (for example Disk Warrior). 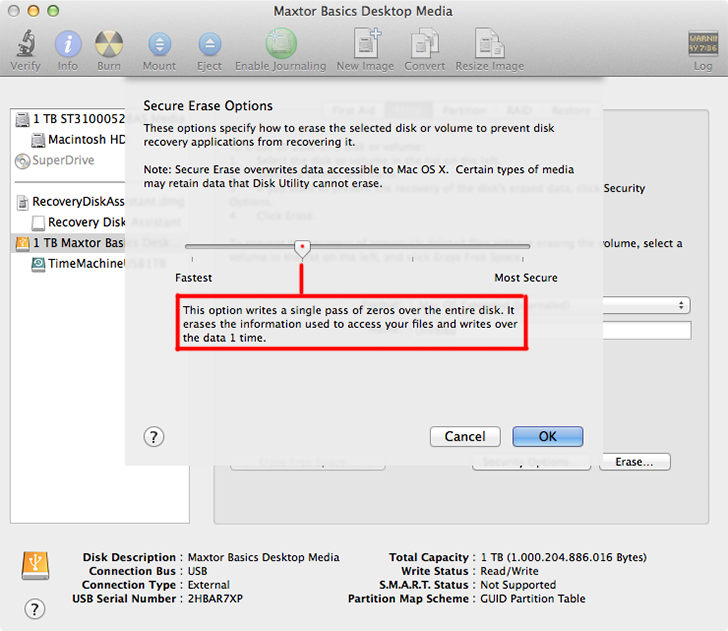 2. erase the hard disk and start from scratch with a fresh Mac OS X => more about this at the next TIP. NOTE: You can erase any external hard drive with ease, but in case you need to erase your boot disk, you better boot your Mac from a USB Recovery stick. What you can do now is installing a fresh Mac OS X system. This means that you only install the Mac OS, and you leave your user data alone. "Install a clean system" is this called. 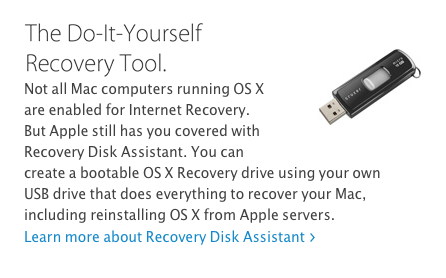 So you're just replacing your 'faulty' Mac OS X system with a new installed one. The installation will leave your user data alone. However: It's always wise to make a backup of all your data BEFORE doing this. In case you use Time Machine, you are in the safe zone. 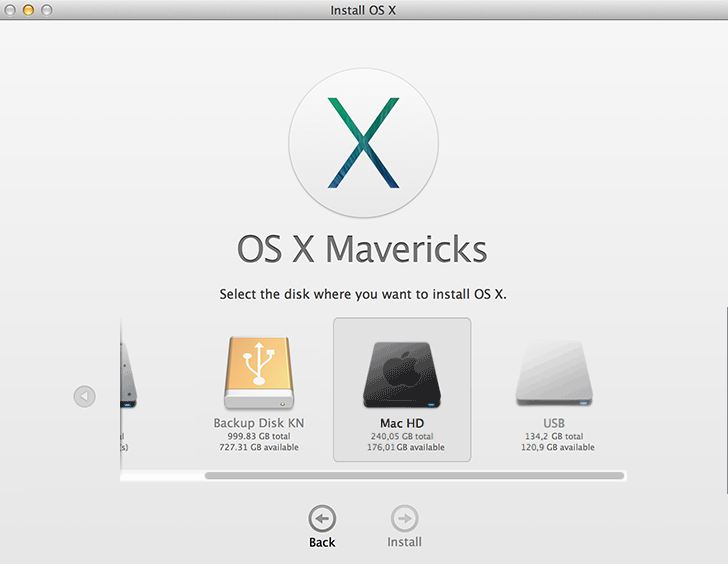 You'll need your Apple ID for downloading Mac OS X 10.9 Mavericks from the Apple Store. 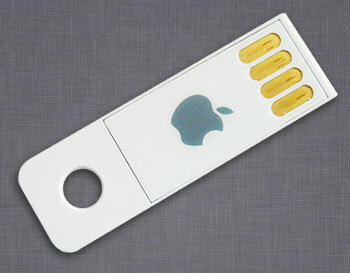 Do you have the original Apple sold 'OS X USB Thumb Drive' with a full Mavericks installer? Then you won't need an internet connection or an Apple ID. NOTE: you can't use both methods (download install and stick install) together. Once you use the stick, you always have to use the stick. 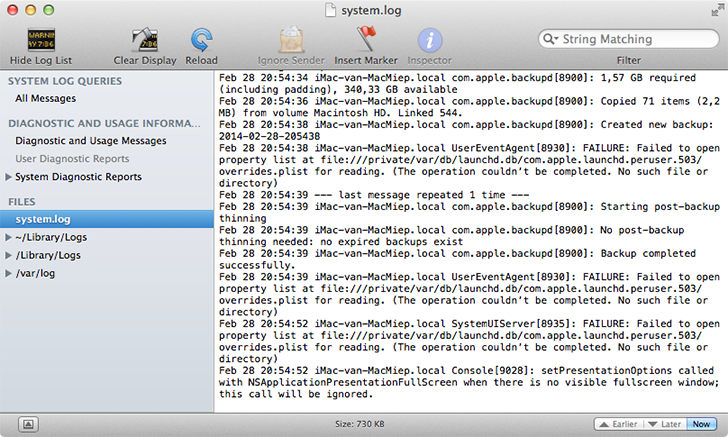 So you have a recent backup on an external hard disk made by Time Machine? GREAT! And this is a backup that was made before the problems started? NICE! Now you can restore this backup and this will be a lot easier. Now you don't need to install a new Mac OS X, but you only need to copy the backup back. Follow the instructions on the screen. 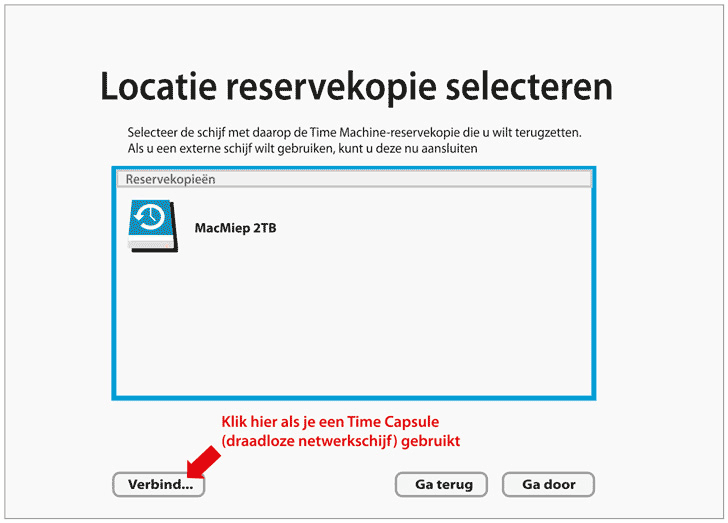 Your Mac will show you the Time Machine data. Don't forget to choose the proper time and date of the backup! NOTE: Depending on the speed of the external hard drive you can go back to work sooner or later. This is a heavy measure on a Mac and most users won't need to do this ever, but it's important that you know how to do it. We are going to erase the whole hard disk. This is only necessary in case there's no repair possible with Disk Utility or other repair programs. Another occassionchoice to do this is in case you want to sell your Mac and you worry about privacy. More about this in the Privacy chapter. Boot from Mac OS X Recovery (Option-key during start up and make your choice) and choose 'Disk Utility'. You can choose to partition your hard disk, in you like. Go to the Partition tab for that. 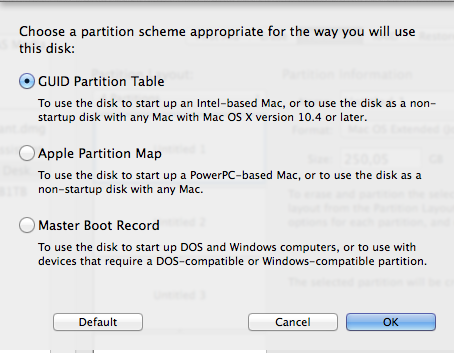 In case you choose to partition your disk, remember to give the Mac OS X startup partition a 'Guid Partition Table'. You can find this at 'Options'. BTW: 'Master Boot Record' is Windows-only. 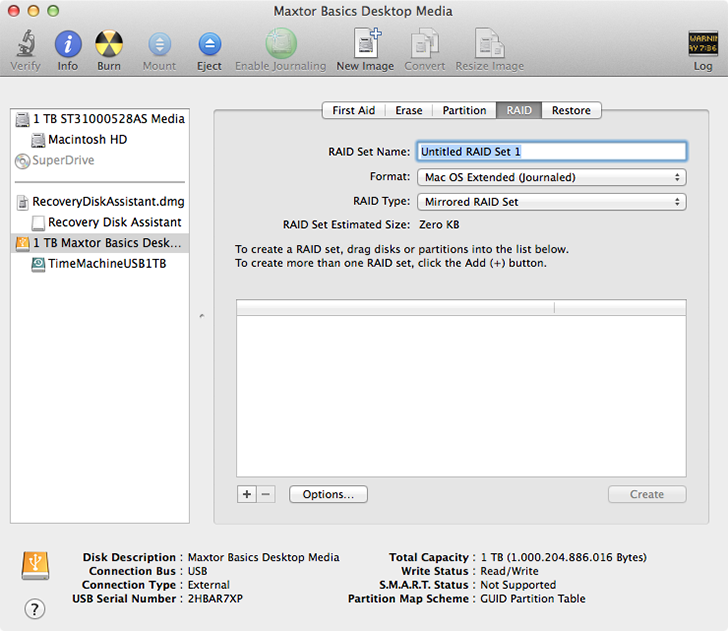 Off course, Mac OS X supports 'RAID': multiple hard disks are virtually connected to make on hard drive. This is used a lot in servers and NAS disks. Erasing can be done in several ways. You can find these at 'Security Options'. Was your hard drive giving your trouble? Then choose 'write a single pass of zeros over the entire disk'. This will take a long time. In case you want to sell your mac, use an even higher security option. See the Security chapter => Privacy. 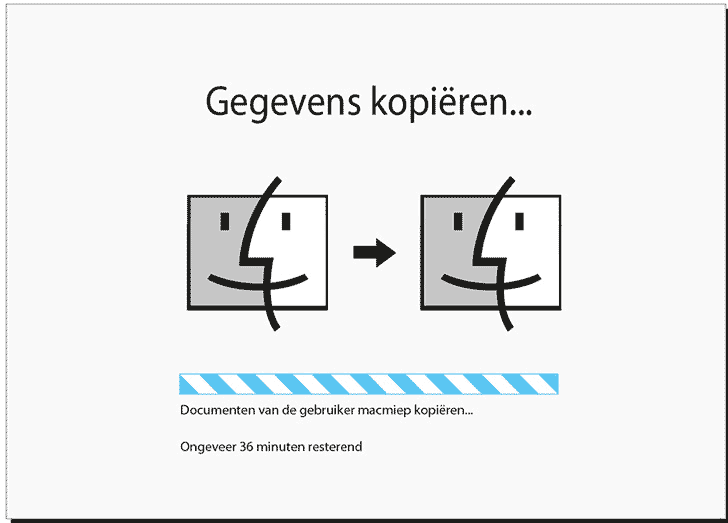 Do not interrupt your Mac during this procedure and keep your MacBook on it's power connector all the time! 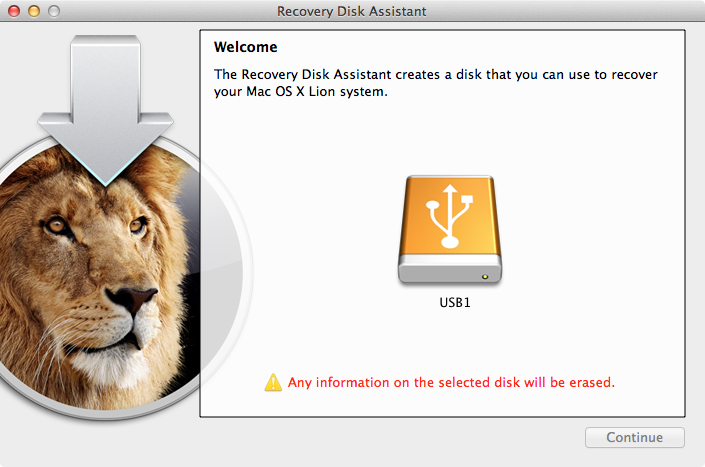 The latest Mac's (Mac OS 10.7 Lion and up) can boot without a Recovery partition or a stick. This is called Internet Recovery. However: a broadband internet connection is required. Boot your Mac with Command-Option-R and Internet Recovery will appear. You'll see a turning world on your screen. Be patient. It will connect to the Apple servers directly to download a recovery partition and place it on your hard drive. Then the Mac is able to boot from that partition and then you have all utilities to repair, restore or re-install your Mac. NOTE: in case you're using Internet Recovery, you are obliged to use a WPA2 secured Wi-fi network or an ethernet connection. After installing Mac OS X you'll get this question. 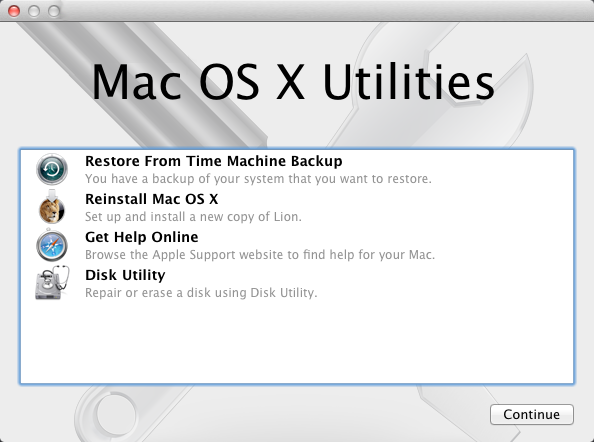 A smart Mac user has a Time Machine backup and is ready for restoring his data. 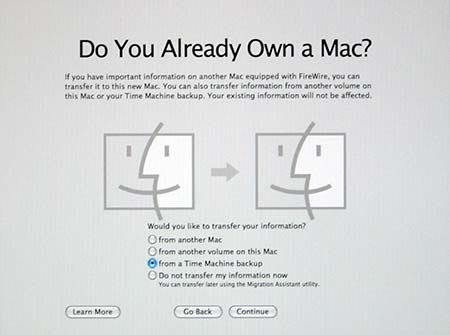 Choose 'From a Time Machine backup' and follow the instructions on screen. It's easy! 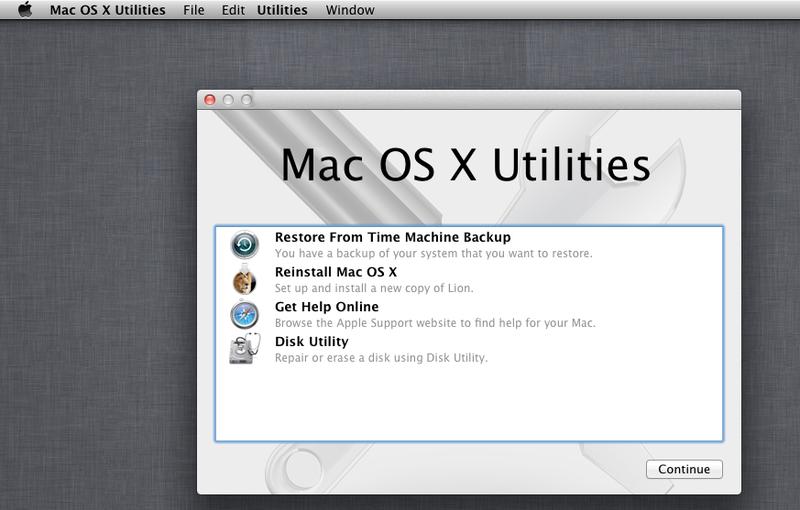 In case you don't have a backup, the Mac will go though the same procedure as if you just bought it. It will ask you to choose an Account Name. Mac OS X and most programs have a Menu called Help. Insert your search word and Help Center will help you find an answer. NOTE: You need to be online for this! Still no solution for your problem? Use the many Mac community websites. Maybe your problem is already known and there's a solution. You can even use Recovery to surf the internet for solutions, as Safari works when you boot from Recovery. As soon as you seek help on the internet or at a helpdesk, be sure to be able to tell what kind of Mac you have and what Mac OS X version it uses. Otherwise they won't be able to help you properly. Click on More Info... to know everything about your favorite fruit. 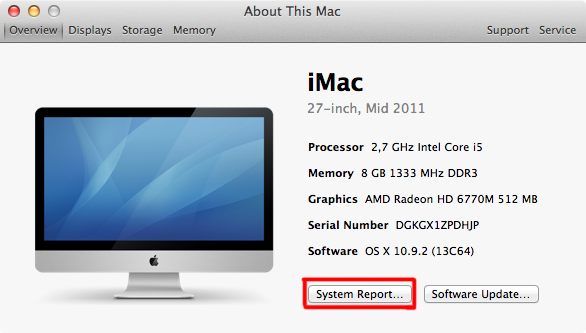 At System Report... you'll find all the details of your Mac. A useful little program you can use is EtreCheck. It makes a neat report of you Mac's system software. It's easy to copy this to email or post on a website.